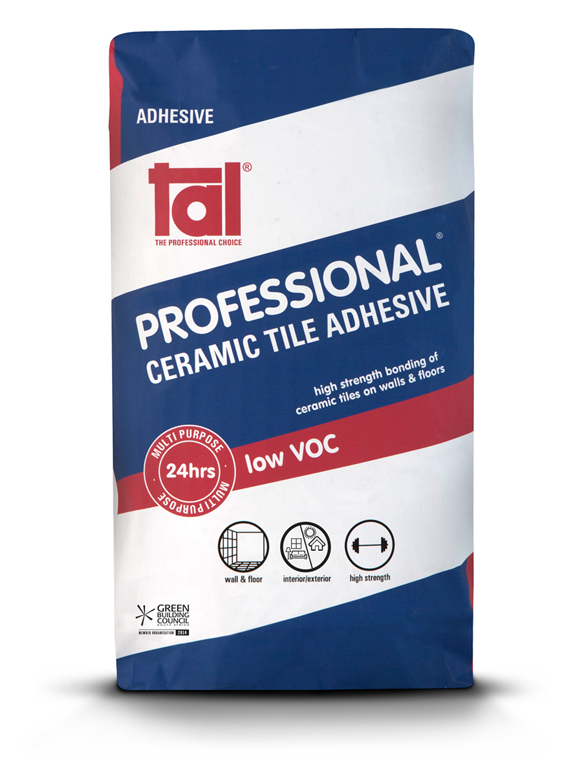 TAL offers a wide range of tiling adhesives to meet every tiling installation requirement. 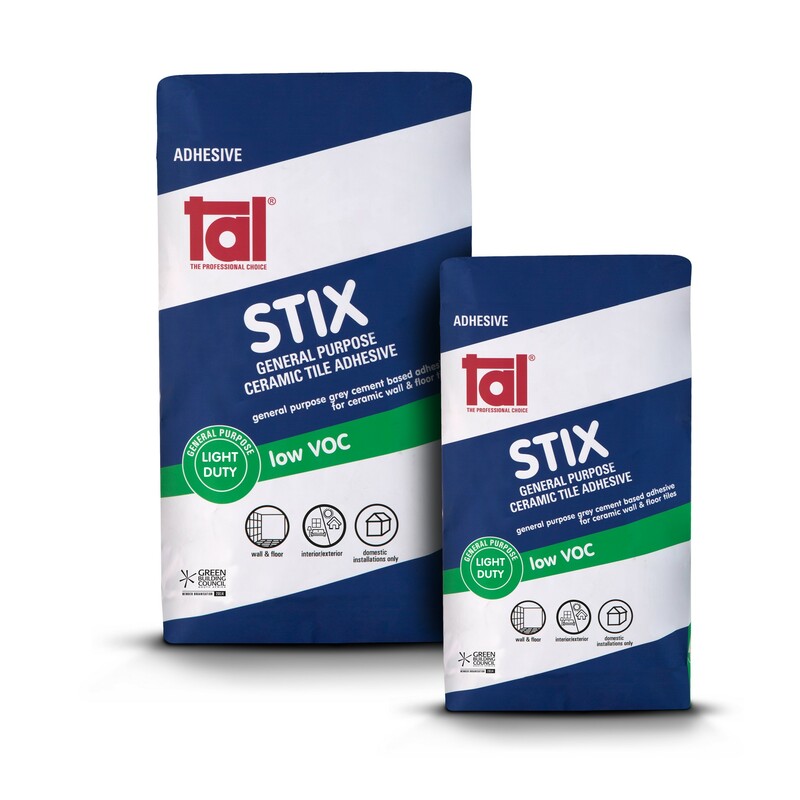 TAL tiling adhesives are user-friendly as they only require the addition of clean water or a latex additive. Another benefit is that they are formulated and designed to ensure a strong and flexible installation. 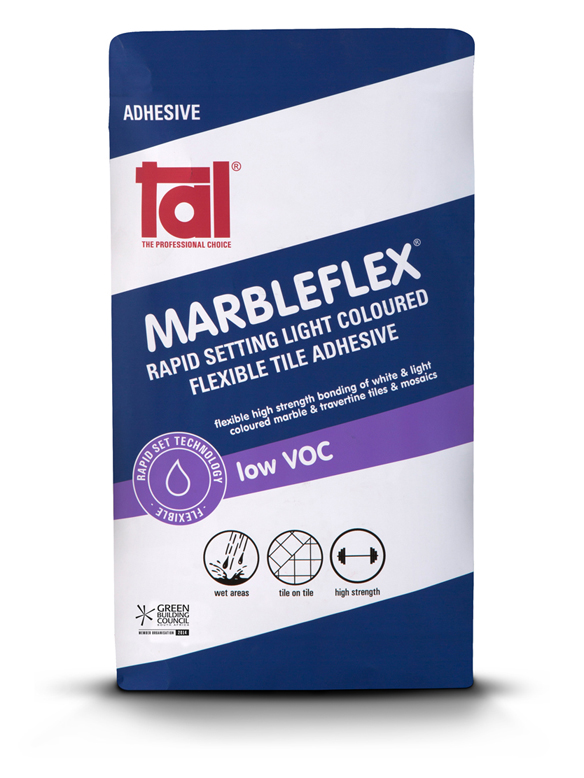 TAL’s range of quality and easy-to-use tiling adhesives include standard-setting, ready-mixed and rapid-setting adhesives. 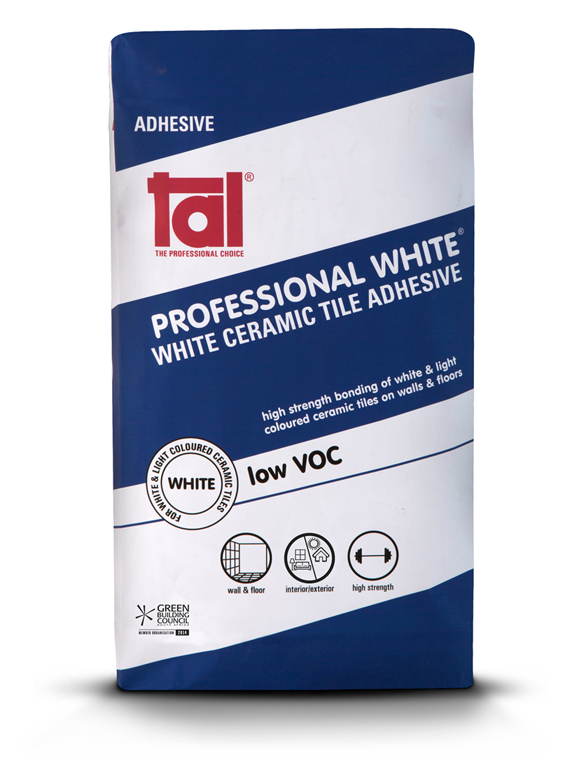 TAL tiling adhesives are suitable for fixing all types of tiles, including ceramic; porcelain; natural stone; clay and mosaic tiles, to walls and floors in interior, exterior and wet areas. 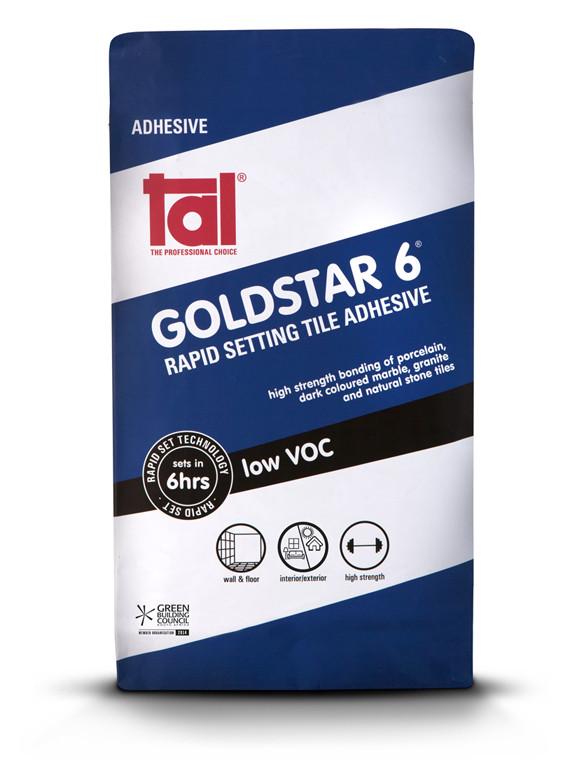 TAL GOLDSTAR 2 is a grey ultra-fast setting high-strength shrinkage-compensated cement based adhesive for fixing ceramic, porcelain, granite, dark-coloured marble and natural stone tiles to walls and floors. 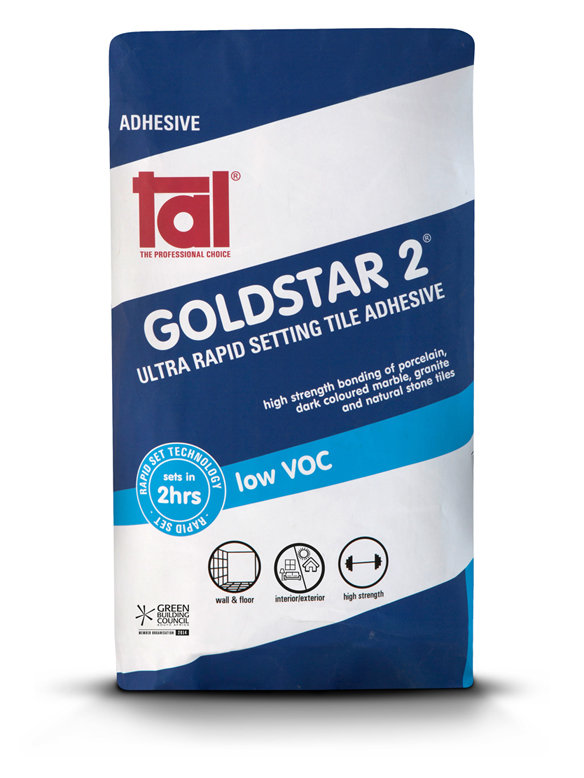 TAL GOLDSTAR 2 is ideal for remedial work and tiling in doorways and passages, where access is required soon after tiling. Application thickness: Between 5 – 12mm, and up to 20mm in isolated areas only. 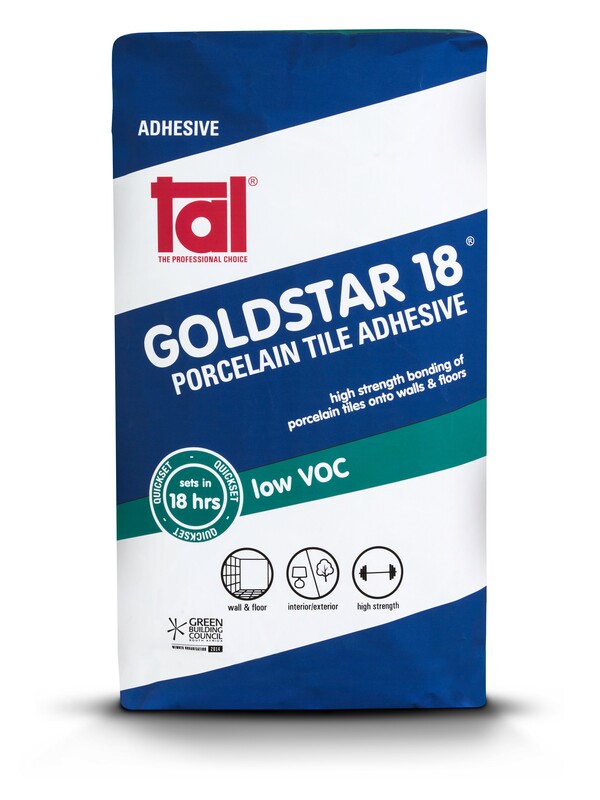 TAL GOLDSTAR 18 is a grey quick-setting high-strength cement-based adhesive for fixing ceramic, porcelain, dark-coloured natural stone (granite, marble, sandstone, etc.) tiles to walls and floors. The adhesive was designed for easy use, allowing an 8 hour pot life. 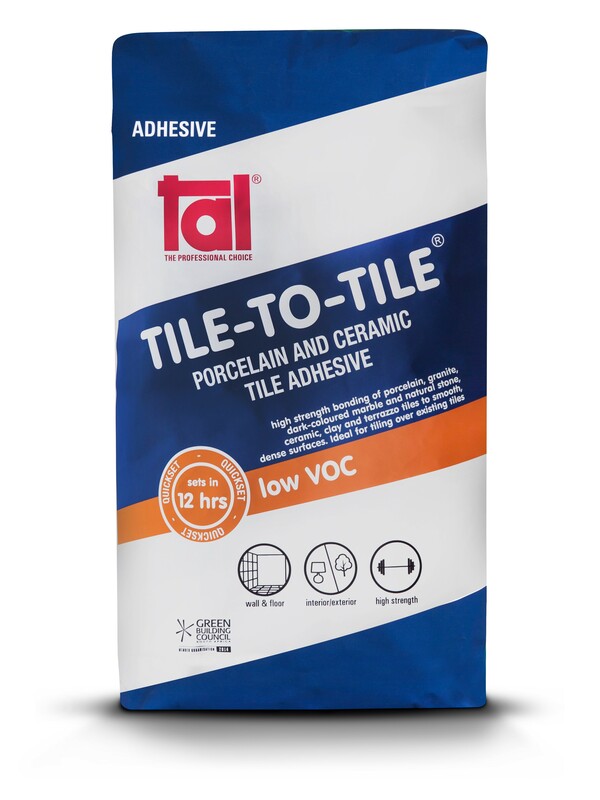 TAL TILE-TO-TILE is a grey quick-setting highstrength cement-based adhesive specially formulated for fixing most types of tiles onto smooth and dense surfaces such as existing tiles, powerfloated screeds, etc. Click here to view the TAL TILE-TO-TILE video. 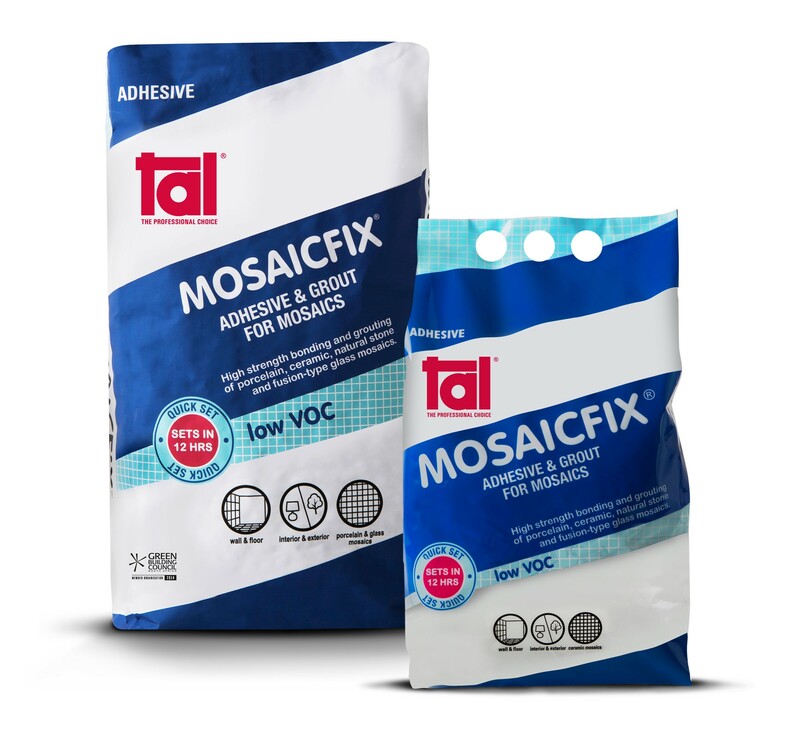 TAL MOSAICFIX is also suitable for fixing ‘fusion-type’ glass mosaics with tesserae no larger than 100 x 100mm. TAL MOSAICFIX is available in Super White and Light Grey. 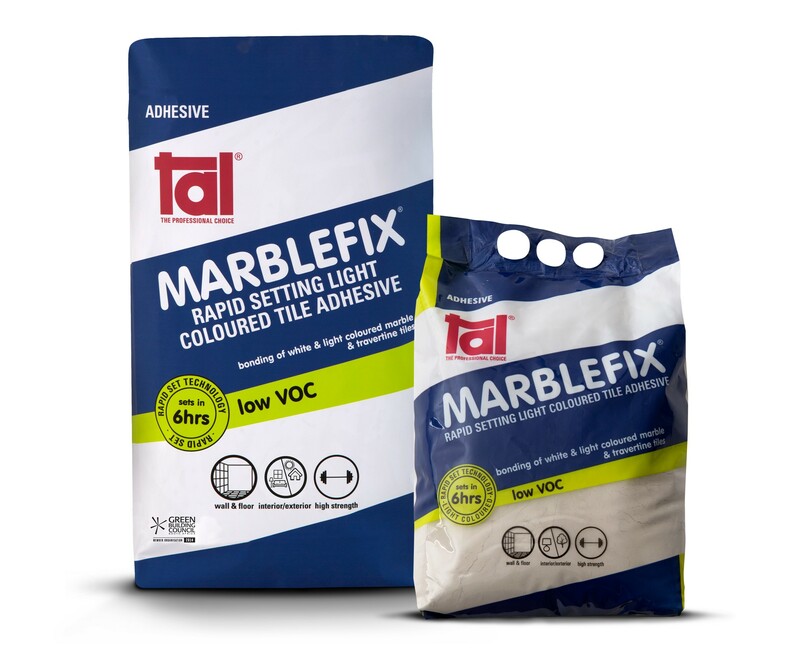 TAL MARBLEFLEX is a light-coloured flexible rapid-setting high-strength shrinkage-compensated cement based adhesive specifically designed for fixing white or light-coloured marble and travertine tiles and osaics, that allows grouting after only 3 hours and full traffic after only 6 hours. 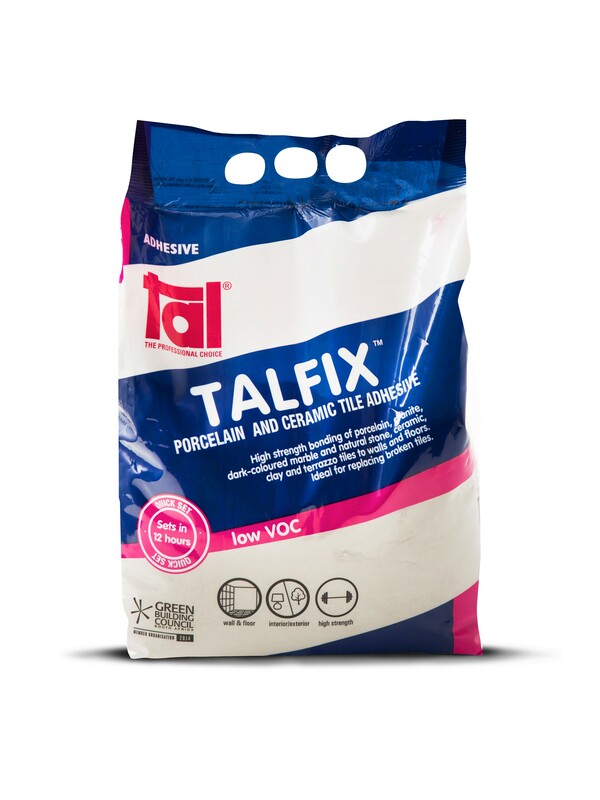 TAL PROFESSIONAL is a grey general-purpose standard-setting cement based powder adhesive for fixing ceramic tiles to walls and floors. The adhesive was designed for easy use, allowing up to 3 hours pot life after mixing. Application thickness: can be applied in bed thicknesses between 3 – 6mm, and up to 12mm in isolated areas only. Coverage: 3kg/m² when applied using Notched Wall Trowel. 6kg/m² when applied using a Notched Floor Trowel. 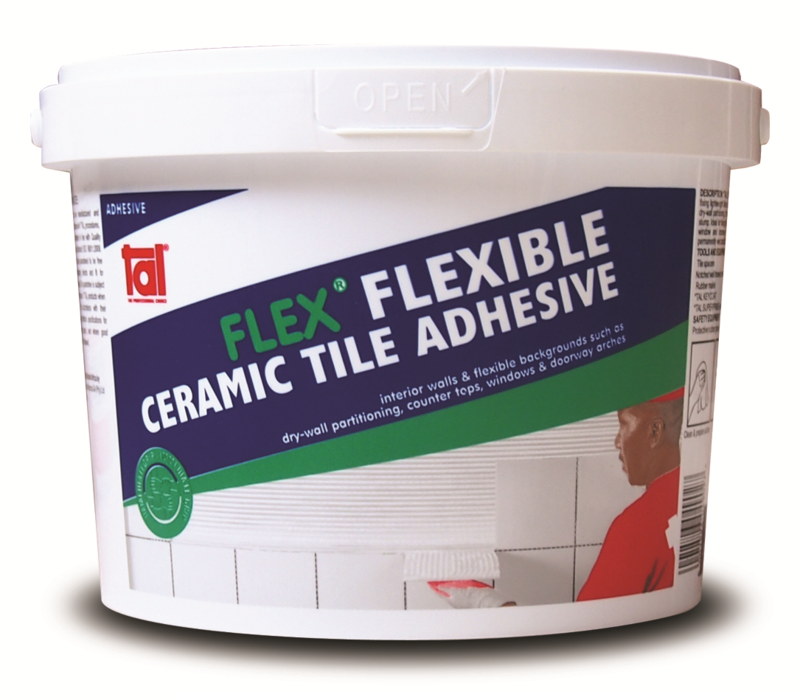 TAL FLEX is a thin-bed polymer-based paste adhesive for fixing lightweight tiles to flexible surfaces, such as partition walling. TAL FLEX has immediate tile-grip characteristics, thus minimising the possibility of tileslump. 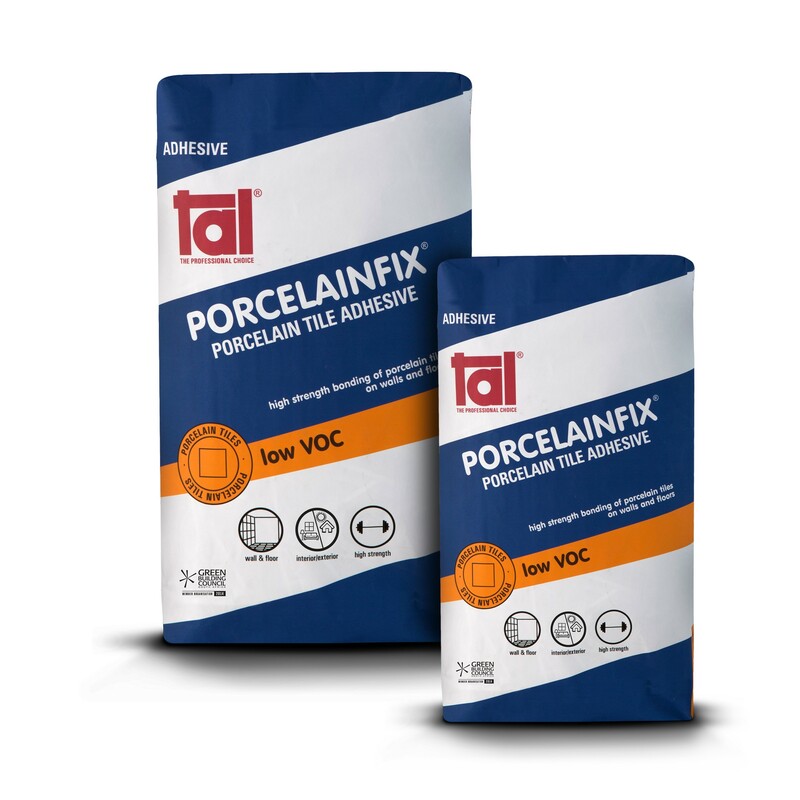 As TAL FLEX gives immediate grip, it is ideal for fixing lightweight tiles in upside-down tiling situations such as window and doorway arches. 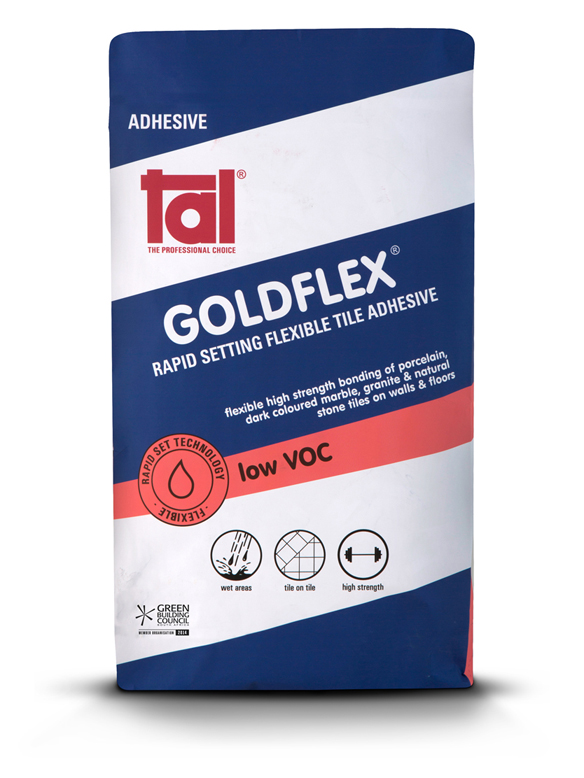 TAL FLEX should not be used in extreme wet conditions,or on floors.